Where to Stay: There are plenty of Airbnb’s throughout Hobart. My group and I decided to stay a bit further from the center of the city (about 40 minutes) to enjoy a beachfront cottage on Opossum Bay. Although it was a bit of a trek, it was worth it. Our little house was homey and extremely comfortable. We had a full kitchen (where we cooked dinner one night), three bedrooms, and a living room with a huge library of DVDs. The owner of the house could not have been more accommodating. Make the 45-minute drive up to Mount Wellington--you will not be disappointed! The view overlooks all of Hobart and is gorgeous. You can park your car at different stops along the way for a hike to the top (you can go from the base of the mountain, or choose an easier climb, which can be as short as one mile). Afterwards, head to David Walsh’s Museum of Old and New Art (MONA). There you will go underground to visit the bizarre and thought-provoking exhibitions. The museum’s architecture is something to see in itself, as it's entirely underground. The MONA is an absolute must! 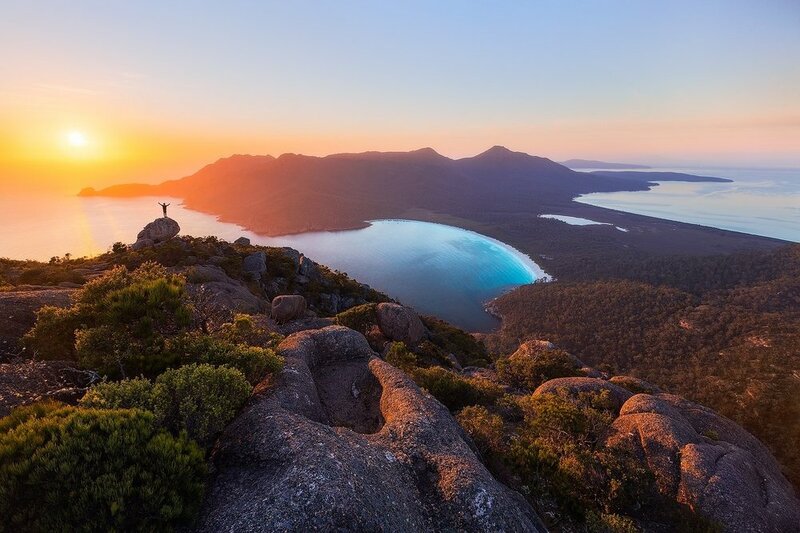 If you are up for a day of adventure, set your alarm for 6:30 am and be on the road to Wineglass Bay by 7:30 am! The car ride is long (a little over three hours), but the journey is worth it. Along the way, we stopped at a vineyard called Devils Corner, where they have delicious wine and wood oven pizza. After we had our fill, we continued on our way to the base of Mount Amos, the mountain to climb overlooking Wineglass Bay. The climb was physically and mentally challenging, but the view was breathtaking. After a delicious breakfast at Pigeon Hole Café (I highly recommend the baked eggs), take a tour at the family-run Shambles Brewery. Afterwards, head to the beautiful botanical gardens, the Queen’s Domain for a relaxing afternoon. Insider Tip: If you are under 21, make sure to rent a car (it's necessary to rent a car in Tasmania!) from AAA car rentals as they allow 20-year-olds to rent as well. They are extremely accommodating and helpful throughout the whole process, especially if it is your first time renting a car and driving on the opposite side of the road.